Three years in the making and one man’s dream comes true. 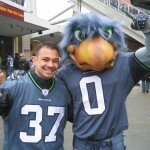 At 31 Hans Steiniger began his quest to visit all 31 NFL stadiums. Traveling across country, he visited 22 states and shared in unforgettable tailgate experiences. TicketCity proudly supported him along the way offering Hans one source for tickets to all of the games. On December 27, 2009 at the Bucs versus Saints game in New Orleans, Hans completed his quest. In celebration of his accomplishment, TicketCity is sending him to Super Bowl XLIV in Miami. So who did he pick to win the Super Bowl? The Indianapolis Colts. Hans will get to see first-hand if his predicition is right. 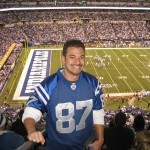 Hans at a Colts game. 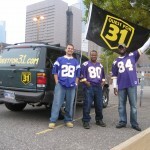 Hans, his friends, and the Quest for 31 battle wagon at a Minnesota Vikings game. What's the best place to sit in the Cowboys Stadium?